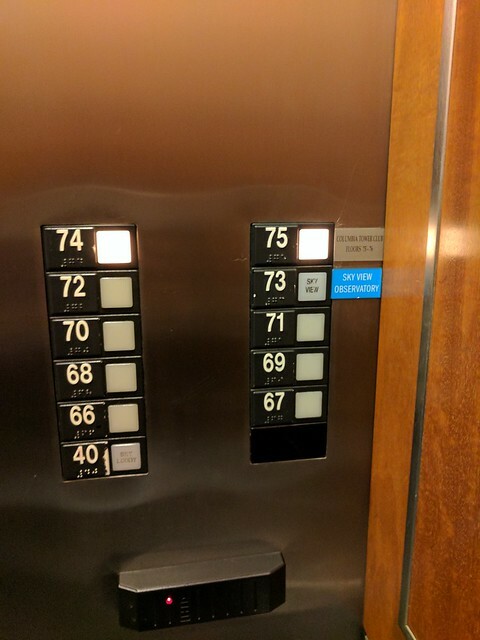 You have to take stairs to the 76th floor, where I spent much of the day. 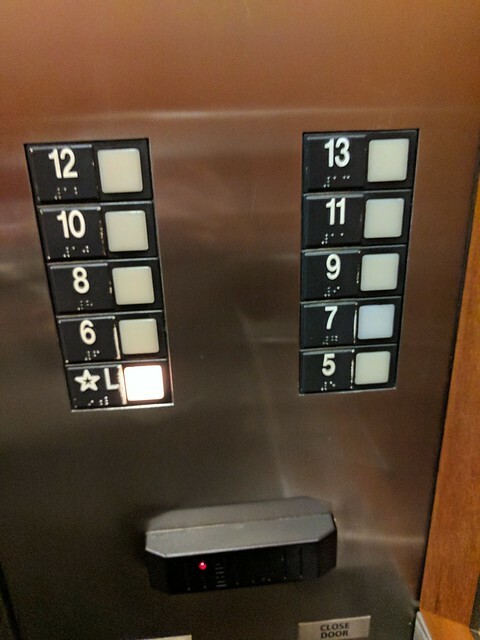 Back up to the 13th floor. 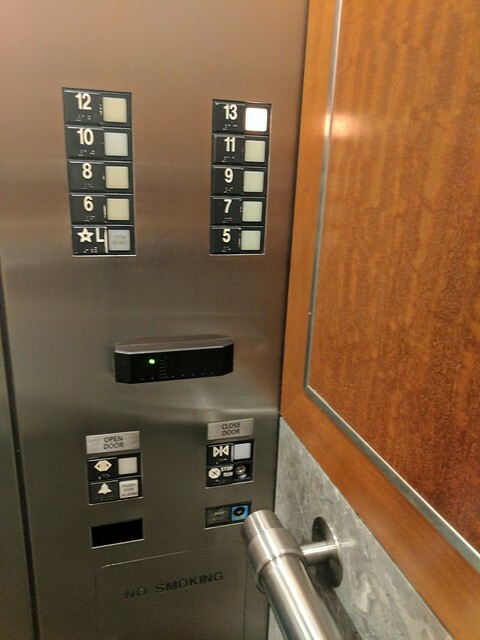 I forgot to include the elevator trip from the parking garage to the lobby and then back down to the parking garage again. 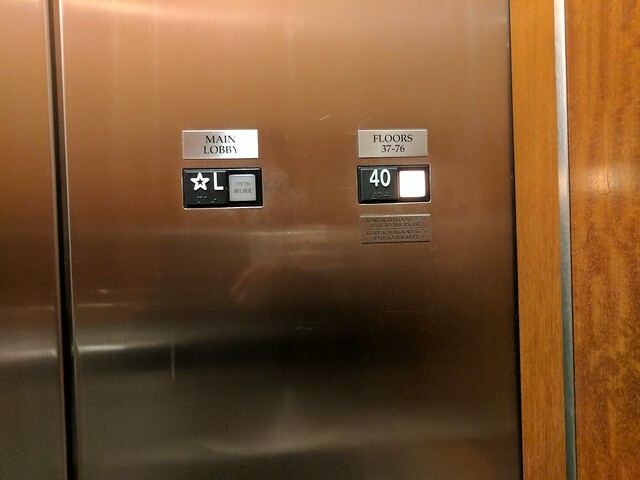 Suffice it to say, I got a lot of elevator rides in yesterday. Evidently this is pretty standard in many fields, but all I can think of is this. Yesterday was more training, including staying late to see how they do a big update, punctuated with more meetings I mostly didn’t understand. So, par for the course. I did a couple of call-in corporate trainings for variety. I have been realizing that one of the things about having been at a job for a long time is that you know where to find everything. At my old job, I knew the file system and all the software we used and the credentials for logging in. At this job, I can barely find my desk, let alone navigate a file system that probably isn’t even set up on my computer yet. The job-specific training of super, but difficult to relate to when my computer is literally an empty slate. I left work late, as I mentioned, and then decided to take a different way home. The pervious times I biked, I rode to Fremont through downtown, and then along the trail from there. Previously I had mapped out a route that went down to I-90 and across the bridge, then up through Bellevue and Kirkland. Both routes came in at 21.7 miles (plus or minus 0.1 miles), so I figured I’d switch between them for variety. I didn’t take into account that the Fremont route had a total of maybe 400 feet of climbing, of which the hill by my house comprised 300 feet, whereas the I-90 route had 1300 feet of climbing. 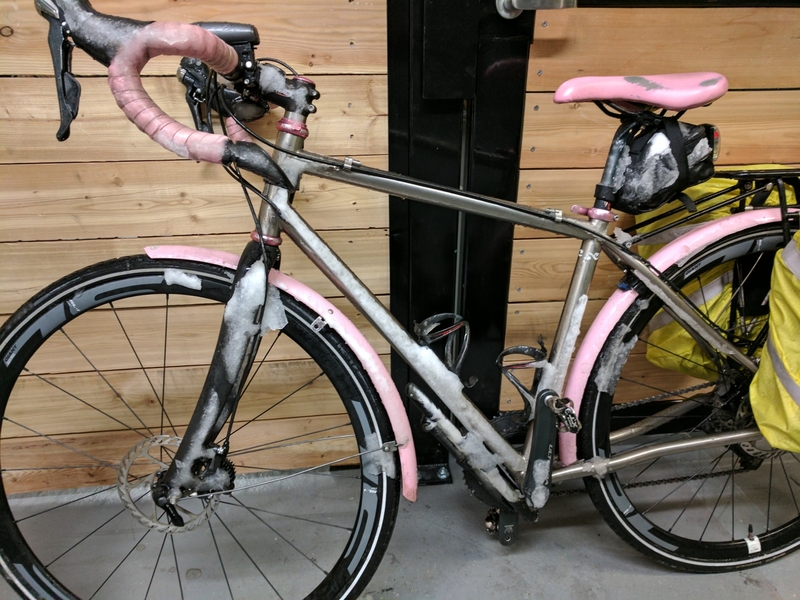 Plus, it involved going through Bellevue, where drivers don’t like bikes, and involved many more stoplights and intersections. Overall, the I-90 way took 5-8 minutes longer than the Fremont way, and I worked way harder for that pace. So: perfect for when I need to start doing hill intervals. Otherwise I’ll likely skip it. On the docket for today: more video training. Hooray! I was going to share some pictures of my work space and general work environment, but yesterday I read the employee handbook and learned that was explicitly banned. Sorry, folks. I spent much of Wednesday do video training on various topics, with a break for some in-person lecture-style training for variety. The good thing about that is that I had some idea what was going on. The bad thing is that after spending the whole day with sometime talking at me, my brain felt overloaded. Most interesting and challenging was the training on performance measurement. At my old job, I just knew we reported TWR not IRR, and that TWR stands for time-weighted return while IRR stands for… Something else. Now I have actually practiced calculating those, I have a much better idea of the differences. This morning I woke up thinking, “I wonder if a flow chart would help clients understand the difference better.” Have to think about that some more, but I think in general the view is that we want to improve clients’ understanding of which to use when, and that right now it’s confusing. I may try sketching out a rough idea anyway. Today is shaping up to contain lots more training, some in person, some live webinars, some pre-recorded, interspersed with a few meetings about things I don’t understand. But I remain confident that I will pick this stuff up eventually, and in a few months things will make do much more sense. So far I continue to be excited to go learn new stuff. Just have to get my brain to assimilate it all. Yesterday, my second day at work, I spent much of the day in meetings, little of which I understood. Starting this job is like moving to a foreign country, where there’s a whole new language and culture, and where everyone is friendly and nice, but they all go about on totally incomprehensible tasks. On the bright side, they have lots of good food. I have started training on the product itself, getting into stuff I never need as a CSA. Apparently I get to study for a Series 99 certification test, although my boss didn’t seem to care whether I passed so long as I learned something. Right now I’m just going through in-house training videos, which I always have found to be a tough way to learn. I’m trying to take notes and pay attention; but mostly I think I’ll learn as I go. Also yesterday, I got assigned my first project, which I have no idea how to start. I trust I’ll get some direction at some point. Oh, and I did get to do a little bit of editing, which was fun. And I met a bunch of people whose names I’ve forgotten. Today I also get some training on the authoring software, which should be interesting. I rode home again yesterday and did some intervals on the trail. I liked that better because after a while that trail feels very long and dark without something to focus on. Plus commuting is tough – just ride as quickly as you can maintain for that distance. I usually end up losing focus and slowing way down after about 15 miles. I’m taking a break today and bussing both ways, but tomorrow I think I’ll try going across I-90. It’s about the same distance, so I’ll be interested to see if it’s any faster or slower. Last and least, I got several huge zits, one right in the middle of my forehead and a few around my mouth, starting on Sunday. My skin looks pretty terrible right now, which is a humbling way to meet all these new people for the first time. It stinks, but I’m stuck with looking like a feckless teen at the height of acne season until my skin clears. I’m trying to just leave it all alone, but it’s taking quite an exercise of self-restraint. So, my first day! It went as smoothly as I could have hoped for, and I think I will like my team and new manager. The office is open floor plan, with minimal little dividing walls between desks. The desks are mostly in clumps of four. My team’s clump is near the bathrooms and kitchen, which is handy. I will have to get used to ignoring people walking by, though; until then, I’ll keep glancing up as my peripheral vision catches something. I was worried about bike parking. 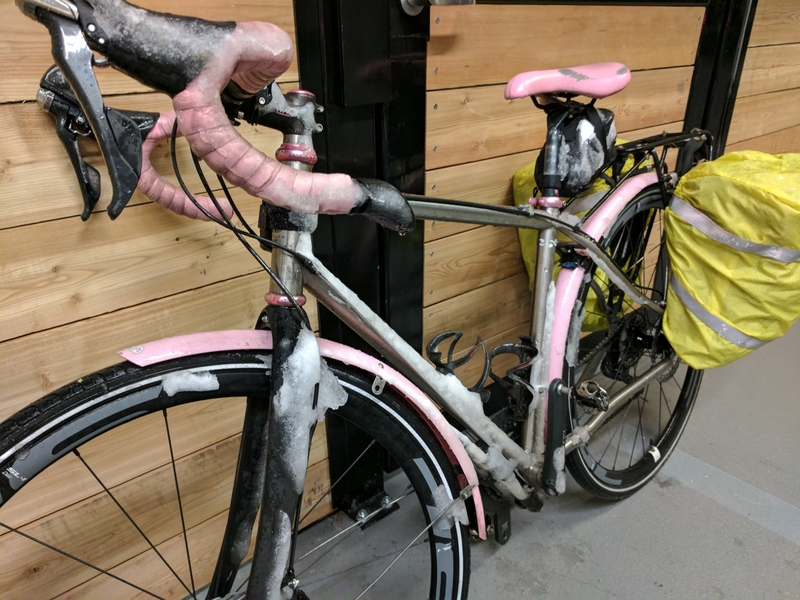 I parked in the garage in a public rack yesterday, using my U-lock and a cable to the back wheel. Eventually, I will get card access to the bike cage, which will make me feel much safer. Until then, I’m OK with the system I used yesterday. 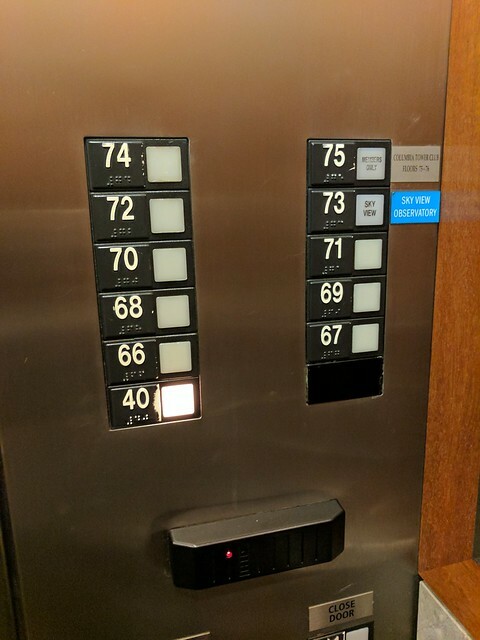 I was also worried about getting lost in the building – a legitimate concern, as it turns out, because the lobby/atrium area is so confusing. 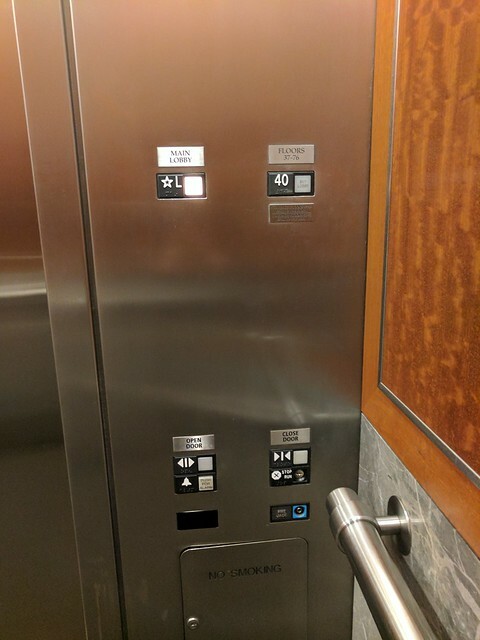 The are elevator banks all over going to a zillion different places, and it’s confusing finding the right one. I’m sure I’ll figure that out with a little more practice. Meanwhile, I’ll just wander around lost until I recognize something. And I was worried about getting home. I made myself several bike routes through downtown and followed one of those yesterday. Seattle has changed so much since I commuted there in 2010! But I got through without a car or bus creaming me, and I followed other cyclists on portions where I wasn’t sure of where to go. Once on the Burke-Gilman, it was simply a matter of slogging home. I learned two things commuting yesterday: I need a snack before I leave, as it really will take me an hour and twenty or thirty minutes; and clothes that feel warm in Seattle at 5 pm don’t feel so warm in Bothell at 6:30 pm. Good to know. As for the job duties, I honestly can’t say yet. It will probably be a while before I do anything meaningful. I’m still optimistic, thankful, and excited to have this opportunity, so I’ll just take that and see what happens next.